Northern Hawk Owl! ((Surnia ulula)) /Hawks Aloft Inc.
How would you like to add this fellow to your back yard bird list? Thanks to Maret Anderson of Anchorage, AK for sending in this terrific imag! Northern Hawk Owls can be found in our northernmost state. This a bird that would never be found this far south in the U.S., but in winters of food scarcity, it irrupts southward into southern Canada and the northern United States. Its long tail distinguishes Northern Hawk Owl from all other North American owls. It’s head and body are broader than those of hawks. 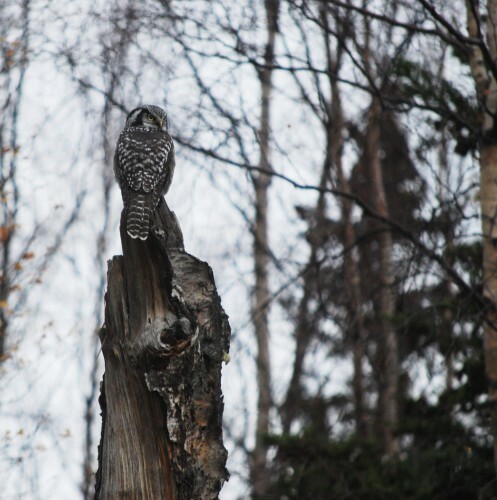 Population densities of Northern Hawk Owls are low throughout interior Alaska. When prey is plentiful, they will remain year-round in Denali and surrounding areas. However, during times of food scarcity, many will leave to find richer hunting grounds. In their never-ending drive for sustenance, Northern Hawk Owls cover vast areas in search of food. In Alaska,they lay clutches of 3 to 7 eggs in April and early May. The female incubates the eggs for 25 to 30 days and broods the young for an additional 10 to 14 days after hatching. During incubation and brooding, the male is the primary hunter and delivers food to the female. 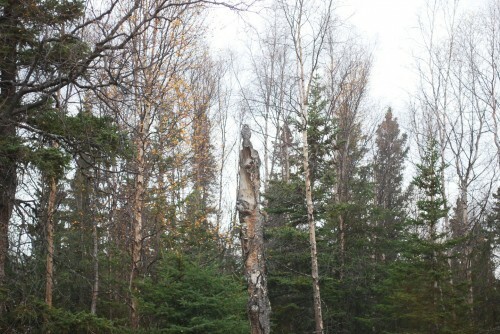 Here is another image of the owl, this one in full view. What a good job it does of blending in with its surroundings!